"Top Pet Rat Expert Reveals Little-Known Secrets About Ratties -- Amazing Facts And Breakthrough Discoveries You Can't Live Without!" "My complete system will have your ratties trusting you as their close friend, doing neat tricks that impress your friends, and living as long as possible. Even if you're almost never home, you're a total beginner, and you don't have time to read through volumes of time consuming material!" What first got me so interested in pet rats almost 3 decades ago was their amazing antics. How could so much personality be balled up in such a small animal? How could they -- unlike a lot of other small animals -- be so genuinely caring? And have such a strong gleam of intelligence in their eyes? And make me laugh for hours watching them play? When I first went to my friend's house one day in 1978 to meet his pet rat, I wasn't so sure, since I had preconceived notions about rats. Since you're at this page because you're a rat owner or contemplating getting rats, I'm sure the story is similar for you. Well, let me tell you... ever since my first acquaintance to rats, I've owned over 1,000 of these amazing animals. They have been great companions to me. I learned everything I could about them, went into breeding, and compared notes with other respected rat breeders through the years. I've even taken my trained rats onto local news shows in major markets such as Boston to show what my ratties can do. You see, while rats make remarkable pets and bring so much happiness to the people around them, they need the right kind of home. They need the right kind of care. You need to do certain things to make sure they're as healthy as can be. You need to do certain things to make sure they've got the perfect living environment, that both challenges their curiosity and keeps them entertained. You can easily prevent any behavior problems... if you know what to do. You see, ratties also need the right kind of training. Train them correctly, and you will have so much fun (as will they!). That's because, as you probably know, rats are very intelligent animals. That means they have the potential to not only be well behaved, but to do some tricks that will dazzle your friends and family. And the problem is that there's not a whole lot of information out there about pet rats. You go to the pet store, and you'll find plenty of books on gerbils, hamsters, and even mice. But not rats. So I decided to write the book myself. Because you know what the best part about rats is? Your Rats And Have A Happy Life Together. You can have a great relationship with your ratties. You just need to know how. Taking care of your ratties is easy and inexpensive. 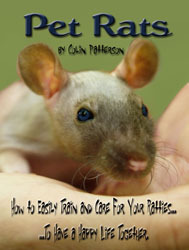 Pet Rats by Colin Patterson will show you how! So I decided to package up my secrets in a guide that I call -- what else? -- Pet Rats: How to Easily Train and Care For Your Ratties...To Have a Happy Life Together. Even though it's concise -- just 110 pages -- it's a complete guide. There's not a lot of fluff or filler. Sure, you may find other books that take up space with pictures. Mine doesn't. Instead it's packed with useful information. Plus I wrote it in plain, conversational English that's easy to follow. As a complete system, it'll reveal to you everything you need to know about your pet rats. Did You Know You Can Train A Rat To Use A Litter Box Every Time, With No Exceptions, In 7 Days Or Less? It makes cage clean-up much easier, giving you more QUALITY time to spend with your rat. Plus it gives your rats a more pleasant living environment, making them happy. I reveal the step by step instructions on page 50. Are you or your family allergic to rats? You'll discover the solution on pages 24 and 25. Do you know what the exciting part is? That you can be learning these secrets to having a healthy, happy, well-trained pet rat in just two minutes from now. That's because I've made my guide digital... which means you can have it instantly! There's no need to wait day after day for a book to arrive in the mail. And there's no need to wait in line at a bookstore. Plus I'm here to help you. If you have trouble, just shoot me a quick email, and I'll help you get your copy ASAP. Click here to secure your copy of my system and have a wonderful relationship with your pet rats (immediate download)! If you're like a lot of pet rat owners, right now you have trouble getting your friends to even come see your ratties -- mostly because of all those negative popular images of domestic damsels in distress climbing on kitchen chairs shrieking, "Ekk! A rat." When you get my guide, you'll dazzle your friends and family as they see your rats doing amazing tricks like walking on their hind legs, kissing you on command, and perching on your shoulder! Before, it would have taken you many months to have your rats trained enough to do these tricks. Not to mention that you'd still be confused about how to care for your rats and have a great relationship with them. But my guide makes it really simple for you. Three months ago I purchased a pet male rat I call Freddy.At first he was very aggressive. He was nipping me and he was a little crazy.I grew to really care for him.The moment I purchased your book. Everything changed for the better.I used all your tools.All he does now is kiss me. I was thinking of getting him a mate.I am a Little afraid of getting a female in fear she will get pregnant.I am also a little scared to get a male thinking they will fight. Freddy is about five months old. Maybe it would be best to just leave well enough alone.I really appreciate your opinion.Your book was a real life saver for Freddy and I.I tell everyone who has a rat they have to buy your book. "I am so thankfull for this guide. I just wish I would have had this 10 years ago when I first had ratties as pets." "I purchased your book almost a year ago and it has been a wealth of wonderful information." "Colin, I really liked your book because it taught me what I need to know to train my little babies. I've already taught them all the stand command. It was really cool when my friend came over today and saw my rats stand in unison." "Your book is well organised and easy to understand. I like that it covers all, from the right cage, to how to train, to how to feed. I learned a great amount from your book and wish you the best of luck, Colin." Well, let's start with this: how much would you pay to have a joyful and wonderful life with your pet rats? How much would it be worth to you to make their lives as good as they can be? How much would it be worth to be able to extend the lifespan of your pet rats by 6 months or more? If you're like most pet rat lovers, the answer is probably, "A lot." Would it be worth $500 to know that almost overnight you can have your rats eating the healthiest diet possible, to live as long as they can? I'm asking you: if I could show you how to have a ret rat that's happy, healthy, well-trained, and loves you dearly... would that be worth $500? You and I are rattie lovers; we both know the answer is, "OF COURSE!" So when I tell you that I'm only going to charge you a modest investment of just $29 for my guide -- and that you can be reading it 2 minutes from right now (even if it's 2 AM!) -- you're going to just go ahead and order, right? I know when you get my guide, you'll be just as happy as the customers above who wrote me. If not, I want you to ask me for your money back. You Can Just Say "Maybe"
In fact, you can check out my system for free if you want. That's because I offer an unconditional 200% money-back guarantee. That means you can grab my guide, Pet Rats: How to Easily Train and Care For Your Ratties...To Have a Happy Life Together, with an open mind, knowing that you're using it risk-free. If you're not completely delighted with the way it improves the quality of life for your pet rats (and for you! ), I'll refund every penny to you -- no questions asked. You don't even need to give a reason -- your word is good enough. But wait a minute, you must be wondering. 200%? The truth is this: since you'll be downloading this guide onto your computer, if you ask for a refund, I have no way to "get my guide back." In fact, some people will come to this site with the full intent of getting a refund and ripping me off. I don't think you'll do that, because as a lover of ratties, I think you're honest and good for your word. But here's my guarantee: grab my guide to pet rats, take your time reading it, discovering its secrets, and applying the enormous knowledge you'll gain. If at any time in the next 8 weeks -- even on day 56 -- you decide you want your money back, I'll give it to you. Right away. On the spot. With no hard feelings. Plus, you'll have the guide. That means you've gotten both the insider information from my guide and the money -- and that is 200%. The bonuses by themselves are valuable enough to sell separately. And I'm strongly considering doing that soon. There are only so many copies of these bonuses that I'm going to give out for free. You can spend the rest of your day with your pet rats like the you did yesterday, wondering if there's more you can learn about them that will make life better for them. Knowing that you've learned about the best foods to feed your rats to keep them healthy. Enjoying the pleasure of training your ratties, setting up crazy obstacle courses, and giving them a fun life. Having an improved relationship with your rats because you know so much more about what makes them tick. If you're still just thinking about getting pet rats, you'll know that you'll be able to take great care of them. After you enter your details into the secure server, you'll be taken to a special download page. Then when you start reading my guide, the improvements in your life with your rats will be nothing short of electrifying... or you'll get your money back. So why not grab my guide while it's still fresh on your mind? There's no risk here. You've got nothing to lose -- and you'll gain a better life for you and your little ones. P.S. If you don't take me up on this special offer (a money-back guarantee and free bonuses!) before it vanishes -- and if you never get to try the secrets contained in my guide -- what will ever change about the quality of life for you and your ratties?